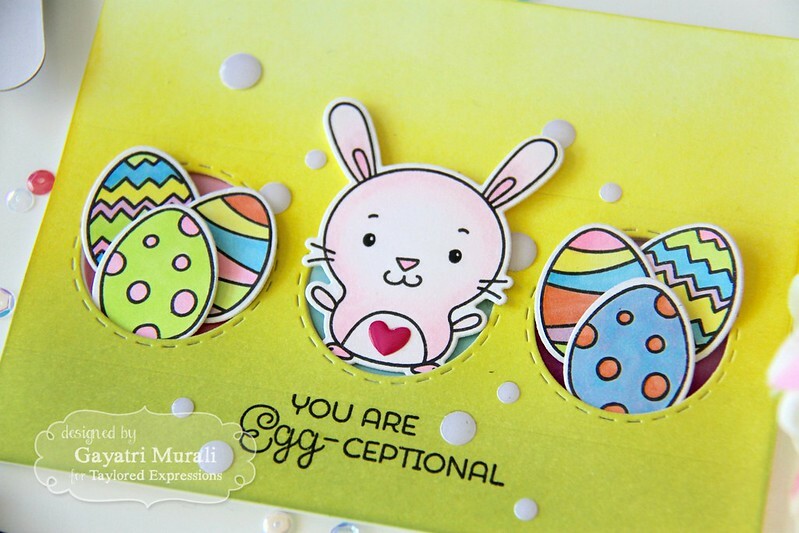 You are Egg – ceptional! Welcome back. This is my second post for today. Here is my SSS challenge post. Today is the day #3 of Taylored Expressions February release. Click here for Day #1 and Day #2 posts. I am sharing couple of projects using three new products. The first one is a stamp set and a coordinating die called Peek A Boo Easter. How cute are those critters on the stamp set. I combined this stamp and die set with an older die called Peek A Boo circle to make my card. 1. Card base is made of Sugar Cube card stock. 2. I trimmed another Sugar Cube cardstock panel to the size of the card front and sponged TE dye inks Granny Smith and Lemon Meringue. 3. Then I used the Peek A Boo Circle die to die cut the panel. I also die cut another Sugar Cube cardstock using the same die and I need the three circles from the die cuts. 4. I sponged one circle with TE dye inks Sprinkles and Saltwater Taffy, the second circle with TE dye inks Lavender Glaze and Plum Punch and the last circle with TE dye inks Cupcake and Strawberry Milkshake. Blending two shades of the colour gave me an ombre on the circles. 5. 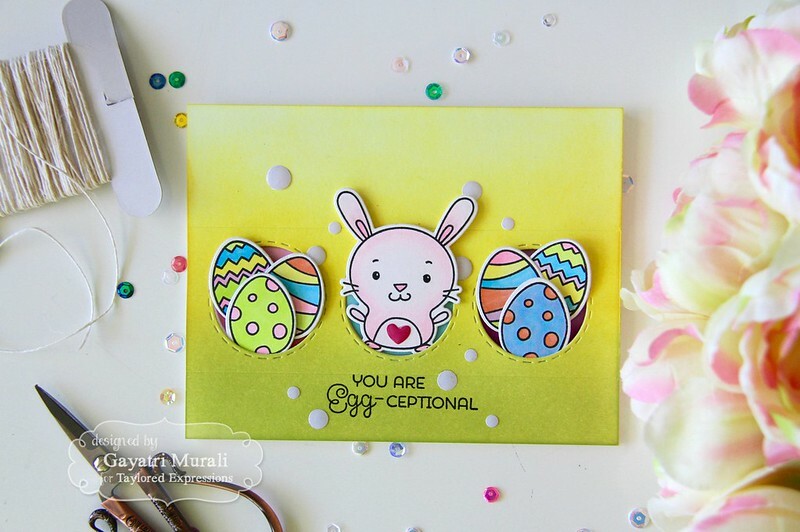 I stamped the eggs and the bunny from the stamp set and copic coloured the images. I used the coordinating dies to die cut them out. 6. I stamped the sentiment below the circle windows on the sponged panel using Oreo TE hybrid ink. 7. To assemble the card, I adhered the sponged panel on the card base using foam adhesives. Then the sponged circles are flush glued inside the circle windows. 8. I then used glue and foam to cluster glue the eggs in groups of three and tucked glued on the left and right of the circle window. Then the bunny is tucked and glued in the centre circle. 9. I used TE enamel heart shape in Lollipop colour on the bunny’s tummy and Sugar Cube enamel shapes around the card. Here are some closeup photos of the card. 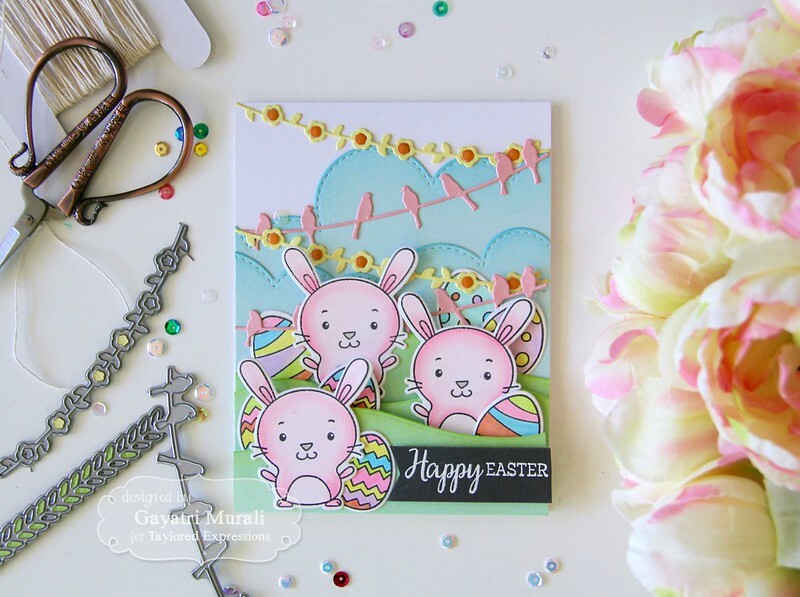 The second card showcases Skinny Mini Spring Borders die set along with Peek A Boo Easter stamp and die set. 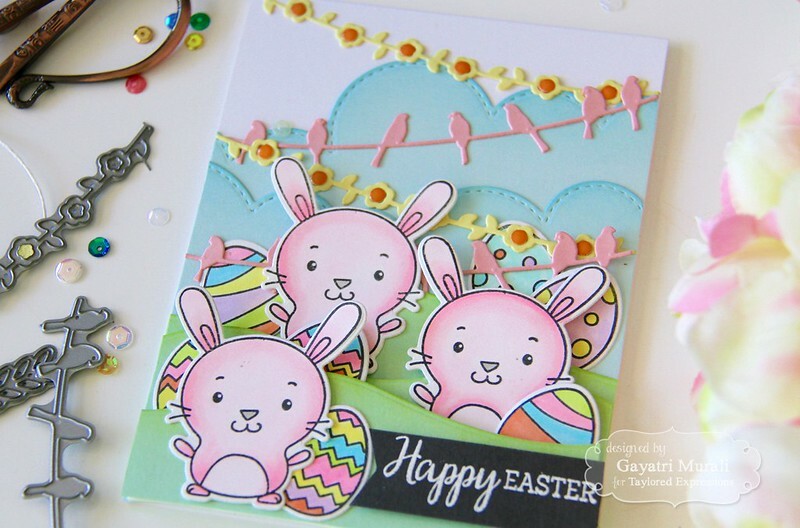 These are cute banners and will add awesome interest to any spring themed card. 1. My card base is Sugar Cube cardstock. 2. I die cut Sprinkles cardstock using the Build a Scene Rolling Clouds dies to make a pair of rolling clouds. I sponged Sprinkles TE ink on the edges of the clouds to add depth. 3. I used Mint Julep cardstock to die cut landscapes using Build a Scene: Rolling Hills dies and sponged Granny Smith TE ink to add depth. 4. 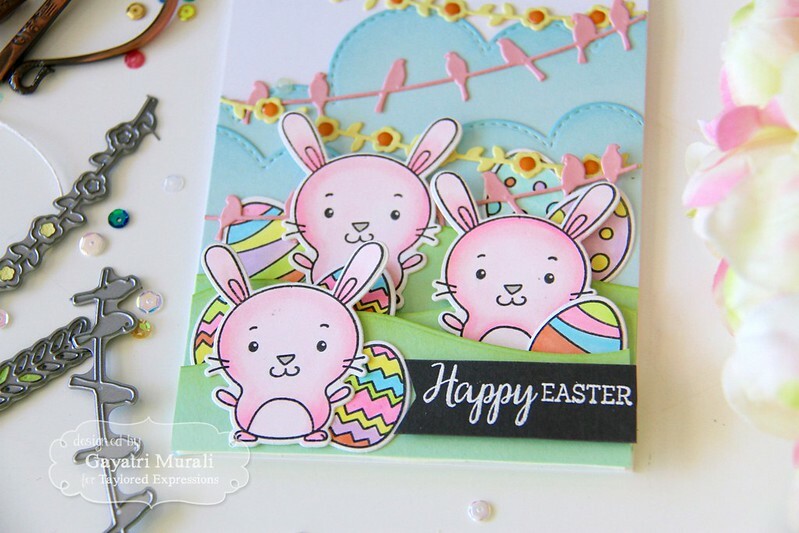 I stamped three bunnies and a few eggs from Peek A Boo Easter stamp set on Sugar Cube cardstock and copic coloured them in pastel colours. 5. I used the coordinating die set to die cut them all out. 6. I die cut two flower banners from Skinny Mini Spring Borders die set using Potato Chip cardstock and two bird banners using Cupcake cardstock. 7. To assemble the card, I adhered the rolling clouds flush on the card front, trimmed the overhang off, then the first hill flush, trimmed the overhang, then the other tow hills using foam adhesives and trim off the overhang again. It is better to trim the overhangs as your go because trimmed a thick layer of cardstock overhangs towards the end will be very difficult. 8. The banners are flush glued on top of the card front. 9. The bunnies and eggs are tucked into the hill layers with glue. 10. The sentiment is from Rainboot Bouquet stamp set which is white heat embossed on a strip of Poppy Seed cardstock. 11. I added TE Candy Corn enamel shapes to the centre of the banner flowers and brush shimmer on the eggs using Wink of Stella clear shimmer pen. Couple of close up of the card. These are just adorable! I love the gradient background on your first card and your scene is fantastic in the second one! 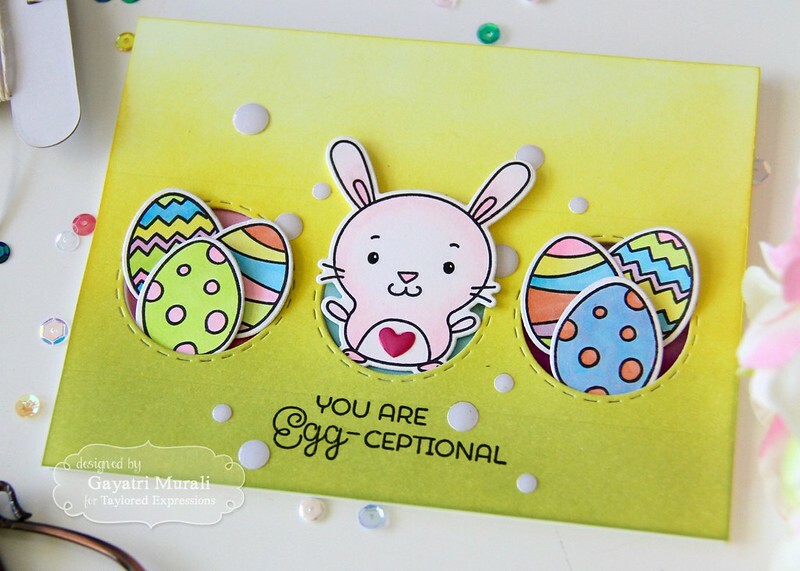 Hello Gayatri, these cards are eggstra special (sorry, I couldn't resist)!